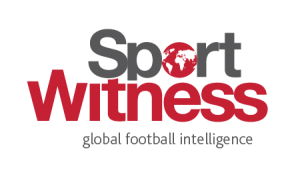 In recent weeks, we’ve been covering Crystal Palace’s scouting of Portuguese football, and particularly FC Porto. With Palace not being one of the Premier League clubs who most often send representatives to matches in the country, repeatedly watching Porto would signal there’s likely a target there. Roy Hodgson’s side have attended three of the club’s matches in just over a week, including the game against Benfica at the weekend. We covered that trip and explained there’s a big hint Crystal Palace have spotted something, adding: ‘Despite losing the match 1-0, Porto didn’t put in a poor performance, and their best player, according to A Bola, was Hector Herrera. 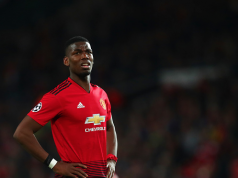 He’s the Mexican midfielder who has a contract expiring at the end of June 2019, and who has been linked with a string of clubs around Europe. If he’s the man Palace are watching, then they may have been given a nudge to more seriously target him, although it would be a very difficult transfer. As often happens, this then ended up on Football.London, but the whole thing was frustratingly taken further than the Portuguese media had done so, in fact they hadn’t even mentioned Herrera… that was us. Football.London have changed it to Palace watching Herrera, rather than them watching Porto and the Mexican being a possibility as we suggested. 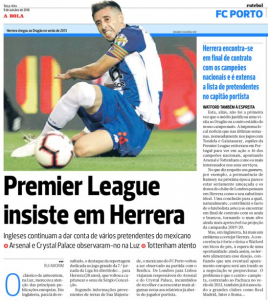 Interest is then talked up as being reported, and the whole thing has now made it back to Portugal, in A Bola, as a big story saying Premier League sides are really keen, leaning on the Football.London report. Arsenal, Tottenham and Watford are also dragged in, but given none of those clubs were at Porto’s match against Benfica, a great chance to see players really tested, it would suggest they’re not exactly obsessed. Crystal Palace may well be interested in Hector Herrera, hence us mentioning it as a possibility (with the caveat he’d probably be looking for something else) but the story has now been twisted into something it isn’t.